Viking Founders: The Independent Order of Vikings was founded by 11 young Swedish immigrants in Chicago. They had banded together to launch a fraternal organization to aid one another in sickness and need, as well as to render a last service to a departed fellow. Even though they had adopted the United States as their new home, there was also a strong desire to maintain and preserve some of the traditions and customs they had brought from the old country. The first organizational meeting was held on June 2, 1890, by brothers Gustaf A. and Charles J. Carlson, brothers John E. and C. W. Meurling, brothers August and R. Walden, Carl Herman Viktorin, August Johnson, Charles Henry, N. Hallers and Gustav Johnson. They called their organization "Vikingarne" and by the end of the year had 30 members and $27.35 in the treasury. In 1892 the society elected twelve delegates authorized to form a Grand Lodge and the first meeting was held October 3rd. This was the beginning of the Independent Order of Vikings with Society Vikingarne becoming Vikingarne Lodge No. 1. In 1912 The Independent Order of Vikings purchased an old home and about 80 acres in Gurnee Illinois. It became known as Valhalla. It was converted into a clubhouse and hotel. 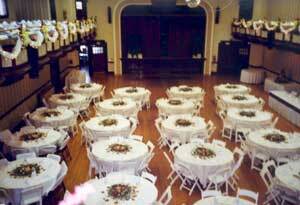 A summer dining hall, a dance hall and a large red brick building were erected. The red brick building was used as a nursing home for elderly people of Swedish descent. By 1915 the Order had 46 subordinate lodges with 7,989 members and was celebrating its 25 anniversary. In 1933 an amendment to the Constitution and Laws was adopted to admit women as members. In 1963 the Viking Valhalla Home was sold due to a decline in use and the expanded Social Legislation in most states. Proceeds of the home was to be invested and the interest to be distributed annually to subordinate lodges to be used as an aged and needy fund for its members. Each local lodge conducts its business in accordance with its by-laws and must provide for a fund for the purpose of rendering aid to members when sick or disabled. Prospective members who are in good health and insurable must purchase life insurance through the Independent Order of Vikings in order to become a member. Eric Thulin, Grand Lodge Secretary from Chicago, came to Jamestown and met with 25 charter members to help organize Ingjald Lodge #65. Bernard Peterson was elected first chief. 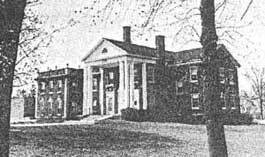 Meetings were first held in Maccabee Hall, then Harmony hall followed by Leif Erickson Hall. A Degree Team was formed to initiate new members. The lodge voted to rent a house in Beachwood, just outside of Jamestown, for the summer and apply for a beer license. The lodge rented a hall in the Arcade building on Main Street and applied for a full beverage license. 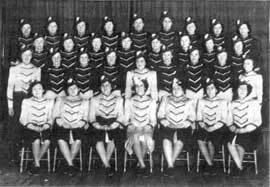 A lodge Drill Team was organized. The drill team was a great pride to Ingjald Lodge and marched in the annual Memorial Day Parade for 15 consecutive years. The lodge held it's 14th anniversary party at the lodge hall. Dinner was served for only 50 cents. Diana Lodge was organized with 25 charter members under the leadership of Grand Lodge Chief John Klingstedt. John W. Carlson (Chief of Ingjald in 1929) was known as "Daddy" of Diana Lodge which he helped organize. He was also instrumental in organizing Ingjald Lodge. Officers were Chief Ellen Carlson, Vice Chief Alice Hanson, Financial Secretary Jennie Hultman, Recording Secretary Edna Gustafson, Treasurer Astrid Munson. It was agreed at this time to hold every other meeting in English. All meetings and initiations up to this time had been held in Swedish. The first joint meeting with members of Diana Lodge took place on this date. Attendance: 35 Diana's; 39 Ingjald. The Viking Temple Corp. was formed. The lodge wanted a separate corporation formed to make any agreements, take title, and manage any property that was acquired. 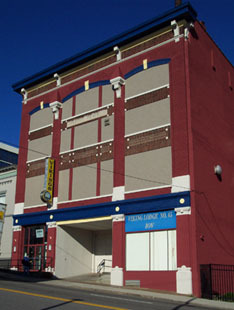 The former Eagle Temple on Washington Street was purchased for $25,000. The original temple was built in 1912 at a cost of $125,000 and was valued at $57,000 on the assessment rolls. The first lodge meeting in the new Temple took place. The Bowling league was formed with 4 teams. Bowling matches with Chicago would start in 1946. A Junior Lodge was organized by Ellen Carlson. It was voted to use only English at all future functions. Viking Male Chorus was organized. 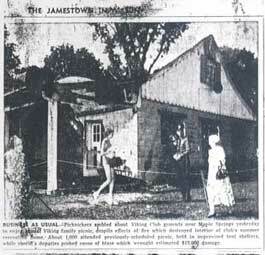 In 1943 there were 3 Swedish Choruses in Jamestown; Harmony, Aeolian and the Workers. The Viking Lodge thought that they should have a chorus and invite these three choruses to join and form the Viking Chorus under the auspices of the Viking Lodge. Harmony and The Workers accepted. 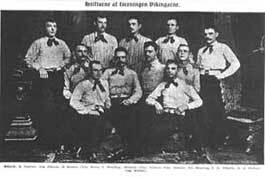 The Ingjald Past Chiefs Club was organized. The building committee of the lodge reported that a large piece of land above Midway Amusement Park was for sale at a reasonably low price and had 1200 feet of lake front. 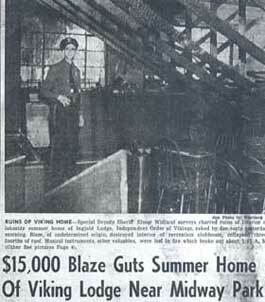 On July 12, 1945, the committee met with the bank holding the mortgage and offered them $500 less and the bank accepted. Later, when the property was surveyed it was discovered that the frontage was 1840 feet instead of 1200. The property contains 67 acres. The lodge voted to purchase 32 cemetery lots at Sunset Hill for our deceased brothers who do not have relatives or means to cover the expense of a funeral. The lodge members also voted to buy a beautiful monument to put in the center of the grave lots. A copy of the deed at Sunset Hill shows that 30 graves were purchased on August 30, 1945 and as of May 5, 1998, there are 7 filled graves. The Viking Drum & Bugle Corp was organized. The first Drum Corp. was formed in 1940. 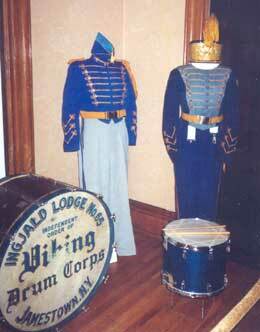 It was reorganized in 1946 when the lodge provided splendid new uniforms and instruments. A "Welcome Home Banquet" was held for Viking Service Men. Of the 71 men from Ingjald Lodge who served during World War II, nearly 60 attended the dinner in their honor. The lodge kept their servicemen's dues paid up while they served their country. In addition, they regularly sent them gifts. Viking Temple damaged by fire. Estimates of damage run between $25,00 and $30,000. Ingjald Lodge hosted the 48th Grand Lodge Convention. This was the first time a Grand Lodge Convention had been held East of the Chicago. Approximately 150 delegates and others attending the convention arrived in Jamestown at 9:02 A.M. on the Erie Train from Chicago. An initiation was held on a Sunday for 133 beneficial and 16 social members, making this the largest class ever taken into the lodge. There were 312 members present at this meeting. 67 members of Ingjald Lodge started the first leg of their journey to attend the Viking Grand Lodge Convention in Omaha, Nebraska. Three large buses took the group to Westfield where they boarded two special Pullmans for their westward trip. Nels Brandel was elected Vice-Grand Chief at the convention. The lodge voted to donate the use of the auditorium free of charge to the "Golden Age Society" which meets twice a month. Each year Ingjald and Diana Lodges hosted an annual Christmas Party for the Golden Agers providing refreshments. Mrs. Cecilia Peterson, widow of the lodge's first chief, received a standing ovation from more than 350 persons present at the Viking Temple. She was praised for encouraging her husband in the establishment of Ingjald Lodge. Erik Thulin, Grand Lodge Secretary, said much was due to Mrs. Peterson's efforts in organizing the lodge. 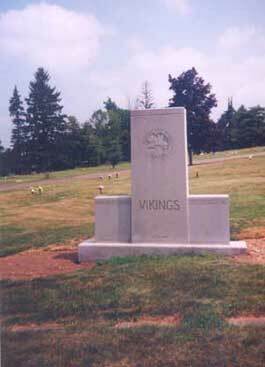 The Viking Monument at Sunset Hill Cemetery was dedicated on Memorial Day. About 500 persons were in attendance. The Viking Male Chorus, The Viking Drum & Bugle Corps., and the Lodge Drill Team all participated in the dedication. A fire broke out at the Viking Lake Park which practically destroyed the building. The fire broke out the day before the Lodge Family Picnic, but the picnic was held in spite of this. Nels Brandel of Ingjald Lodge was elected Grand Chief of the Independent Order of Vikings at the 50th Grand Lodge Convention held in Moline, Illinois. The Boat Club was organized in the spring of 1955 and Vic Anderson was elected Commodore. Trygve Lindahl of Ingjald Lodge was elected Grand Chief of the Independent Order of Vikings at the 54th Grand Lodge Convention held at the Sheraton Hotel in Chicago. Diana Lodge was the first lodge to establish a Scholarship Fund for the sons and daughters of members. This was the brain child of Hillevi Freling Rydell. Martin Hagstrom of Ingjald Lodge was elected Grand Chief of the Independent Order of Vikings at the 61st Grand Lodge Convention held in Rockford, Illinois. George Arnold of Ingjald Lodge was elected Grand Chief of the Independent Order of Vikings at the 64th Grand Lodge Convention held in Jamestown, New York. Philip A. Taft of Ingjald Lodge was elected Grand Chief of the Independent Order of Vikings at the 69th Grand Lodge Convention held in Jamestown, New York. The Merger of Ingjald and Diana Lodges took place on this date with both lodges now becoming Ingjald Lodge #65. A Ingjald Lodge Past Chief's Memorial Monument was placed at the Viking Lake Park with the names of 73 past chiefs plus 3 honorary past chiefs and 5 Past Grand Chiefs. Allen Emmett Johnson (Ingjald Chief 1999) honored nationally as Viking of the Year 2000 for the Independent Order of Vikings. Diana Lodge #114 reorganized with 22 charter members. Ingjald Lodge #65 Celebrates its Diamond Jubilee with a dinner dance up in the Ballroom. Juanita "Toots" Porter (Ingjald Chief 1998 and Diana Chief 1978 & 1987) honored nationally as Viking of the Year 2002 for the Independent Order of Vikings. Courtney Anne Pavlock Junior member of Ingjald Lodge #65 honored nationally as Junior Viking of the Year 2003 for the Independent Order of Vikings. Tim Fagerstrom of Ingjald Lodge was elected Grand Chief of the Independent Order of Vikings at the 76th Grand Lodge Convention held in Jamestown New York. The Down Town Building was auctioned along with its contents. It had become financially difficult to maintain two different club locations. Economic times have changed, taxes increased, and ways of increasing revenues began to diminish. 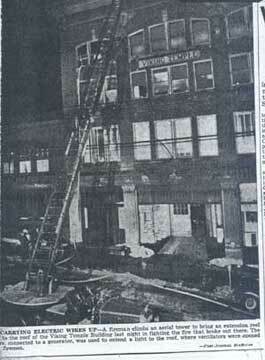 The closing on the building was completed and the lodge office was moved to 214 North Main Street. The money from the sale of the buildings contents would be used to make improvements at the Lake Park, all other to be invested. The 78th IOV Grand Convention was held in Jamestown, NY with our own Bill Peterson becoming the new Grand Chief. The 81st IOV Grand Convention was held in Jamestown, NY. John Pavlock was elected and installed as Grand Chief of the Independent Order of Vikings.